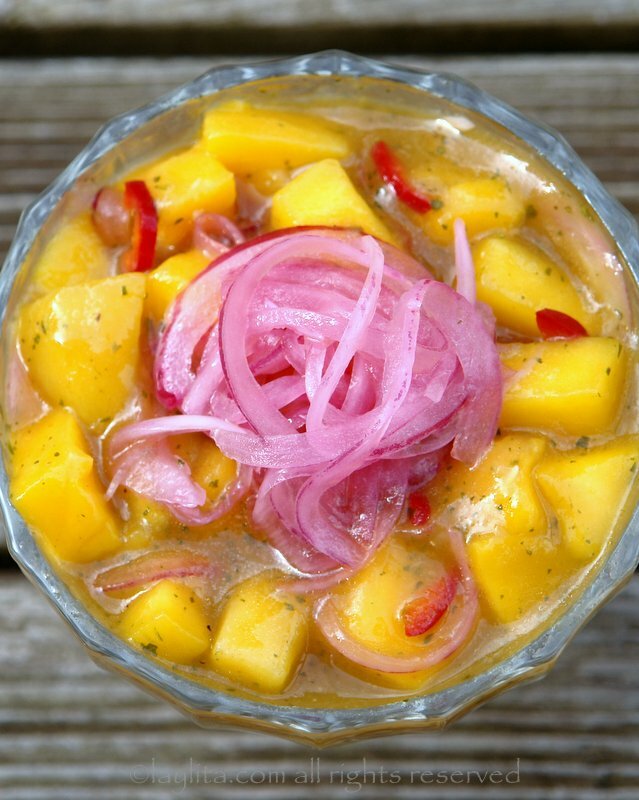 This refreshing mango ceviche is prepared with fresh mango, onions, lime juice, orange juice, habanero and/or fresno red chili peppers, cilantro, salt. I originally shared this ceviche recipe almost 10 years ago. 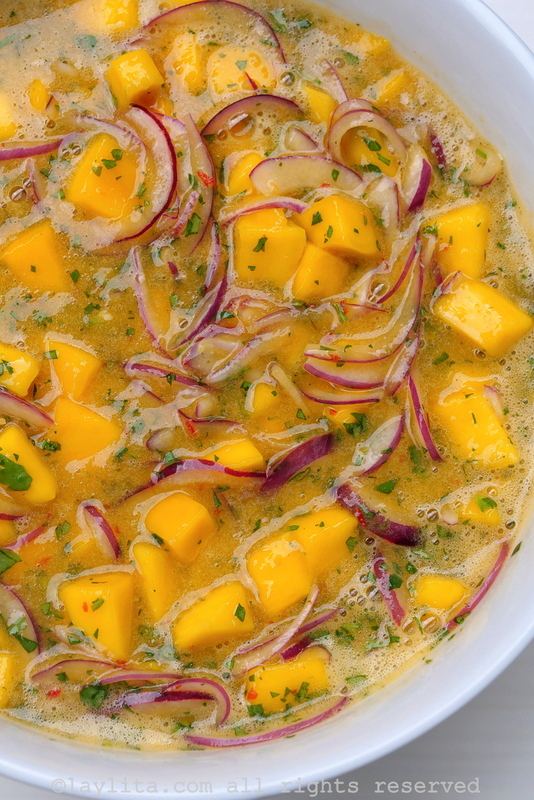 In the last years I’ve changed the way I make this mango ceviche- for the better would like to think. One of the main changes is the addition of orange juice and habanero chilies – it’s such a great combination with the mangos. I removed ingredients a couple of ingredients (sugar/tomato sauce) which are no longer needed since the orange juice has enough sweetness. 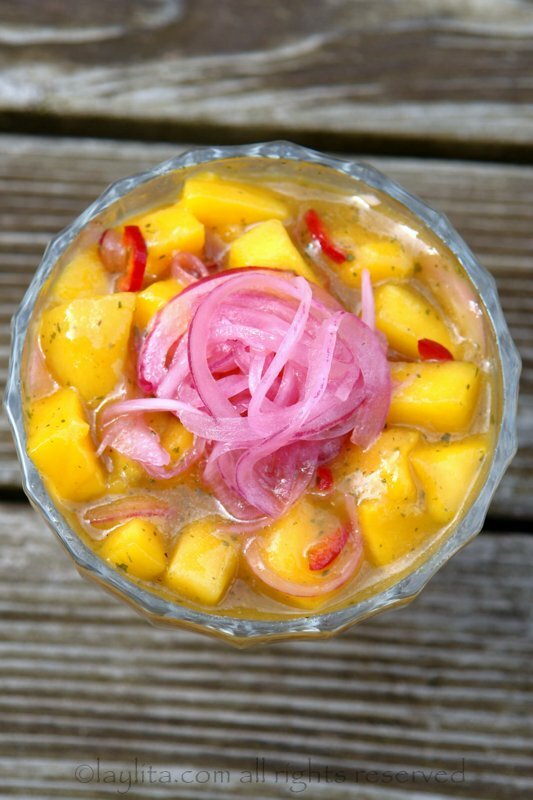 This vegan mango ceviche is best if refrigerated at least 30 minutes (an hour is ideal) before serving, this allows the flavor of the sauce to marinate the mangos. 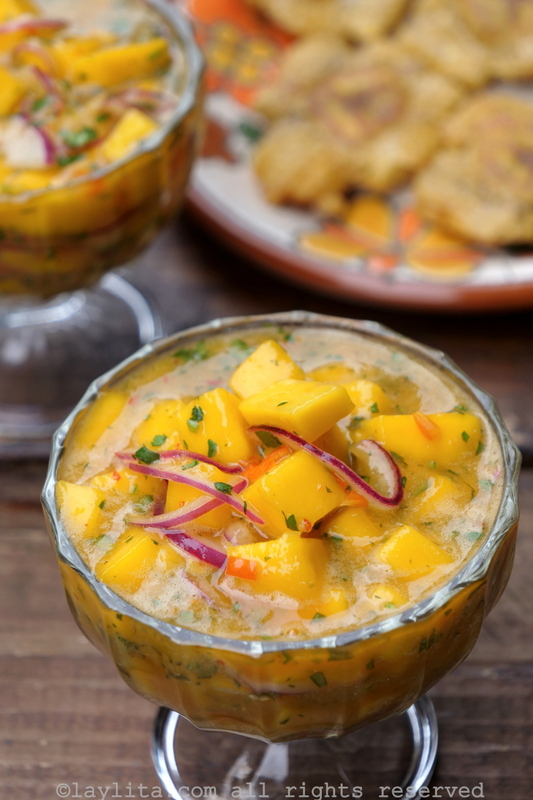 You can serve the mango ceviche with patacones – thick fried green plantains – or with chifles – thin green plantain chips. Other garnishes that you can choose from include tortilla chips, popcorn (trust me it’s great with ceviche), avocado, and/or additional red pickled onions. 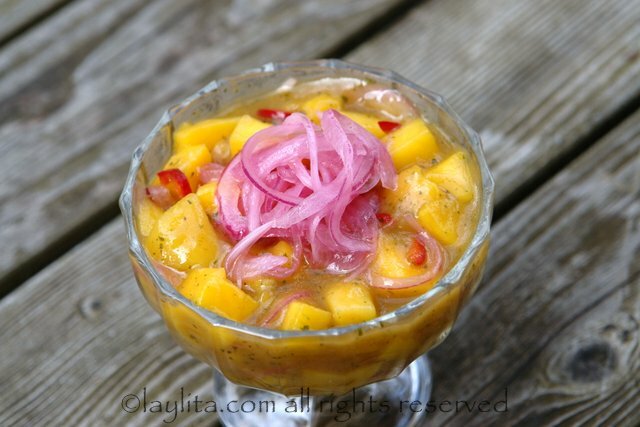 The first time I made this vegan mango ceviche for my husband, he asked “where’s the seafood/fish”?. There’s a general misconception that ceviche should always have fish or seafood. Yes, the most popular ones do include those ingredients. However, growing up in Ecuador we had ceviches made with chochos (a lupini bean), with hearts of palm, with mushrooms, chicken (fully cooked of course), broccoli / cauliflower. In the southern city of Macara, there’s even a ceviche de carne made with beef. Habanero hot peppers are very very very spicy, but their flavor is amazing. I usually remove the seeds and veins (using gloves) and they still add a lot of heat. If you want it a less spicy version you can use red fresno chilies – or your choice of mild hot pepper. Or you can use a mix of both. I added a few habaneros and a red fresno chili (with the seeds). You can always start by blending just one hot pepper with the citrus juice, then taste the mix and add more if you feel it needs extra heat. If it’s too spicy, you can add more orange or lime juice. If you aren’t sure if you or your family/guests can handle the habaneros, you can leave out the hot peppers – or have some diced/sliced chilies on the side for those who want to add it. 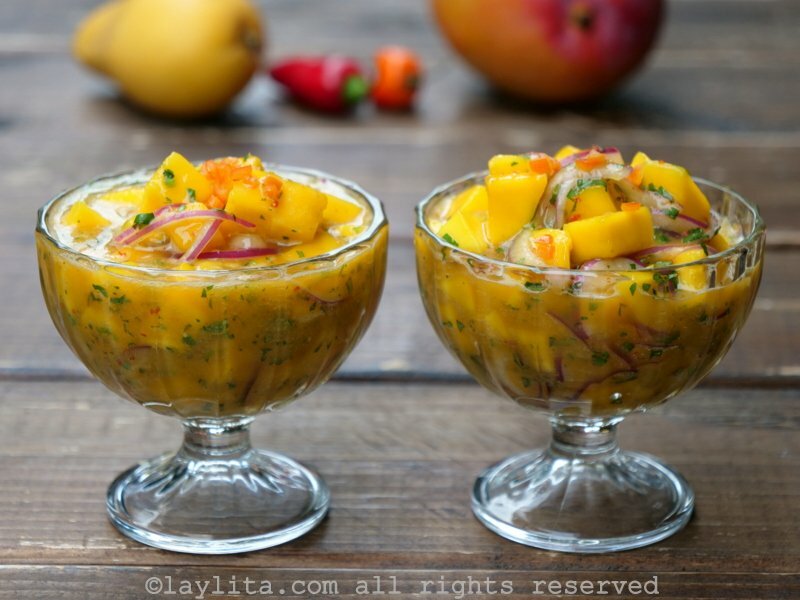 You could also split the mango ceviche into 2 bowls and make a half batch of the sauce without the spicy peppers. I do this when I’m having guests over and know that there will be children or people who can’t have anything spicy. Mango ceviche recipe prepared with fresh mango, onions, lime juice, orange juice, habanero and/or fresno red chili peppers, cilantro, salt. Sprinkle the red onion slices with salt and soak in cold water for about 10 minutes, rinse and drain. Peel and dice the mangos. Reserve a few pieces (about ¼ of a mango or less) to blend. 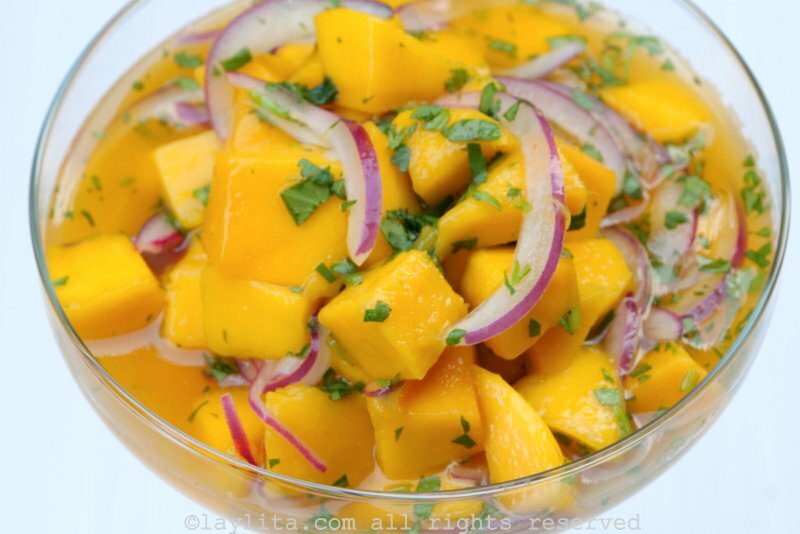 Place the diced mangos, the red onions, a little bit of chopped cilantro, and a pinch of salt in large bowl. Add the juice from 2-3 limes, mix and let rest while you make the habanero orange juice. In a blender, combine the rest of the lime juice, 1 cup of orange juice, the reserved mango chunks, the habaneros/red chilies, salt + optional oil. Blend until you a smooth juice or sauce. If your blender has the ability to completely liquify all the ingredients then you can use the sauce as is. If you prefer it completely smooth or there are small chunks (of hot pepper) that didn’t fully blend then I recommend straining the sauce. Pour the orange, lime, mango, habanero sauce over the diced mangos and onions. Add the rest of the chopped cilantro. Mix well. Taste and adjust salt if needed. For the best flavor let it marinate for at least 30 minutes in the fridge before serving. 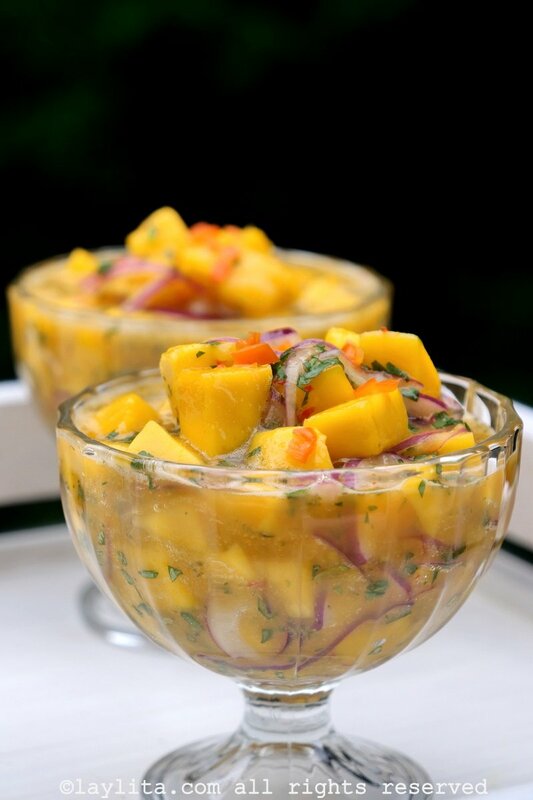 Serve the mango ceviche with green plantains chips, either patacones (thick double fried green plantains) or thinly sliced chifles. Other sides/garnishes that you could serve include tortilla chips, popcorn, avocado, pickled red onions. 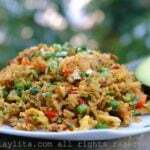 For a non-spicy version omit the hot peppers, or serve them diced on the side for those who wish to add them. 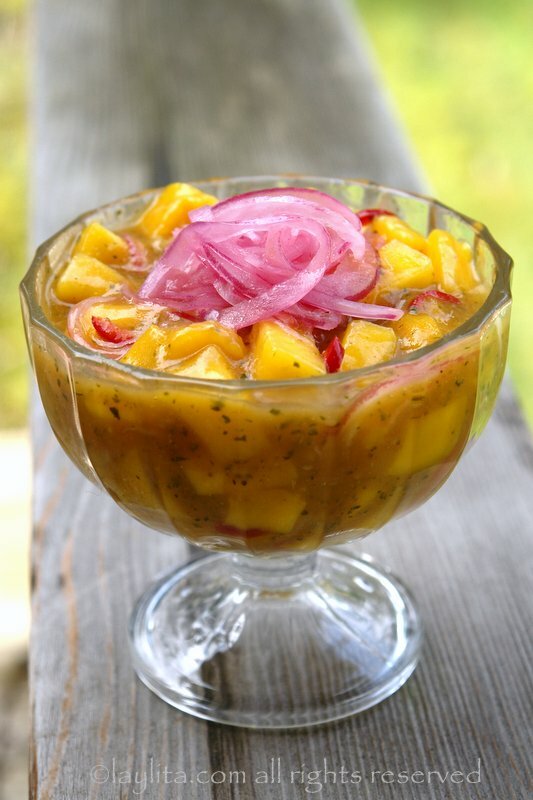 Another suggestion is to split the mango ceviche into 2 bowls, make one spicy and one without any hot peppers. 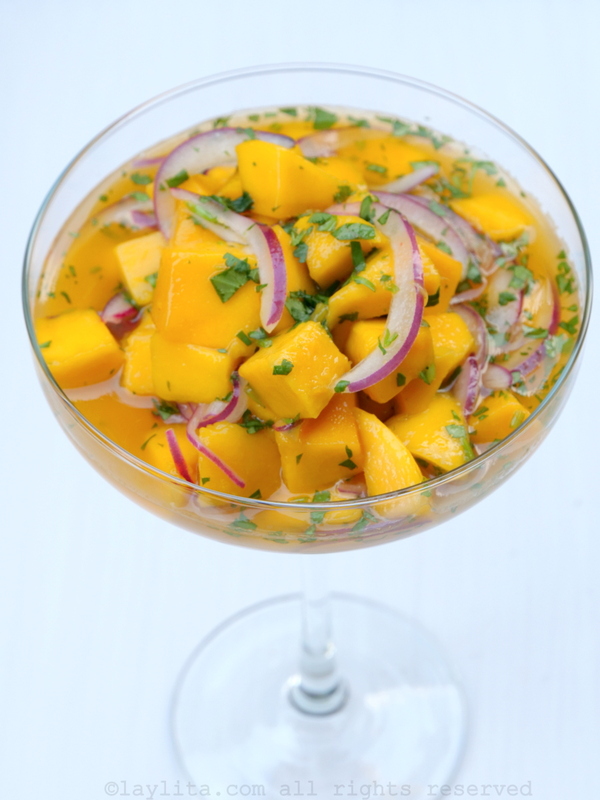 Another tropical variation for this mango ceviche would be to use passion fruit instead of the orange juice. I lived for about 8 years in Lima, Peru. Therefore I am completely in love with Peruvian cuisine, specially ceviche. Since I moved back to Brazil I have prepared several variations of ceviche. But never one like your recipe. So, today, Easter Sunday, I decided to prepare this mango ceviche recipe to be served before the main course (bacalhao roasted with cashew nuts). I have to admit I was not very confident in the outcome of this ceviche. But it was amazing! All of us loved it. 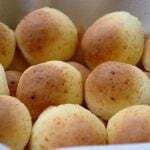 So I would like to thank you for sharing this delicious recipe! 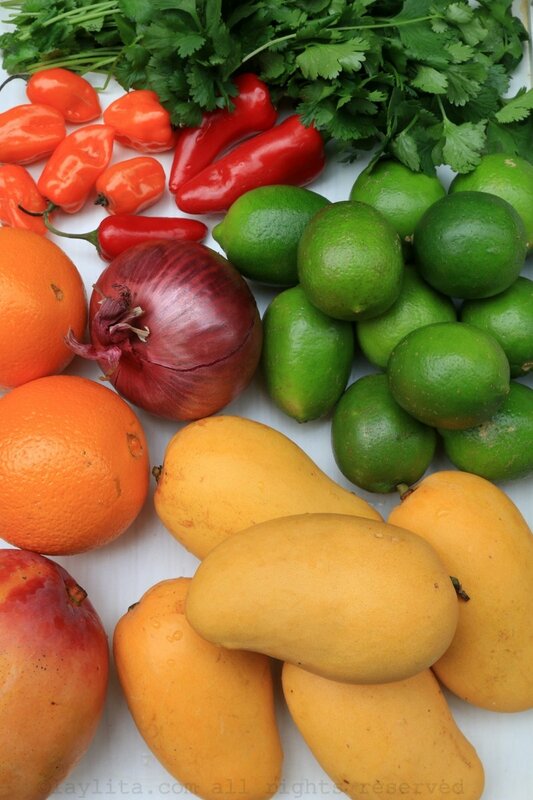 Do you know of other fruit ceviches in Ecuador? Not that I know of, at least not where the fruit is the main ingredient. 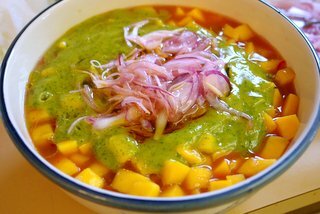 Ceviche can made with fruit juices (instead of lime juice), some the fruits used instead of limes include passion fruit, granadilla (similar to passion fruit but as acidic), bitter oranges, toronche, among others. There is a ceviche with palmito or hearts of palm. I will be in Ecuador this summer and will see if I can find other fruit ceviches. I used fish sauce instead of the salt…. A bit of Thai…. absolutely delicious! Yummy & beautiful…my kinda ceviche – no fish ;) It’s a lot like a relish we make. I’ve never seen it served with fried green plantains or green bananas tho!